This may be the earliest I’ve visited a Starbucks for this blog. But there’s something motivating about waking up at sunrise and starting the day with coffee and writing before work. No, I don’t do this often; the real reason I’m up this early is that I have Beyonce tickets tonight and there just isn’t enough hours in the day. 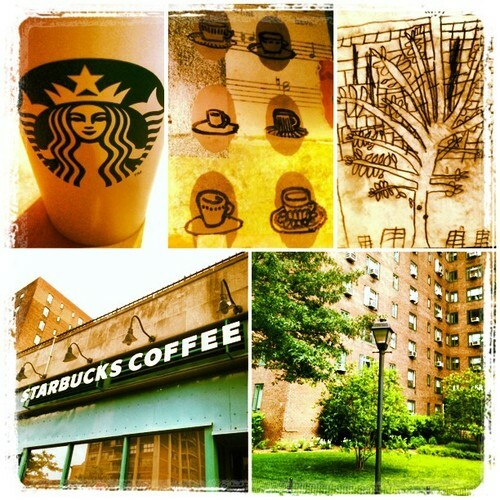 For the last Starbucks in July, I’m paying a visit to the East Village. 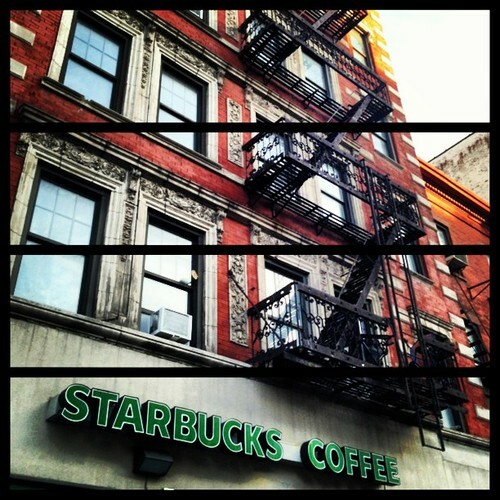 On 9th and 2nd Avenue, there is a sizable Starbucks, just north of St Marks Place. This Starbucks has what most don’t — an outdoor seating area. No, it’s not fully secluded from passersby like the Starbucks in Yorkville ,but it does have a 3-foot high metal gate separating you from the sidewalk crowd. It even has a large awning that extends from the side of the building. 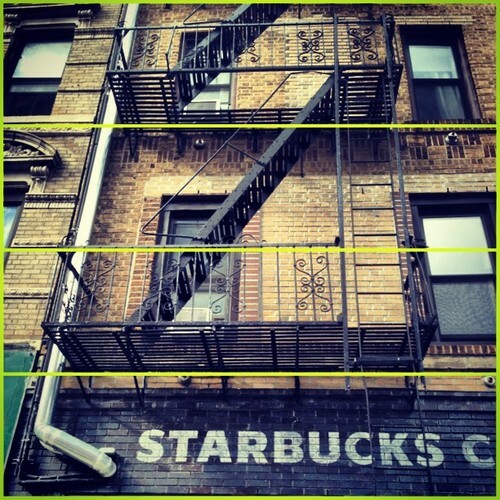 Inside, this Starbucks has exposed brick pillars and walls that really give it the NYC vibe. There is plenty of seating (especially at the crack of dawn), and it’s spaced enough for it not to get too crowded. All in all, I’m a sucker for a Starbucks with an outdoor area, but I’d have to come back to see what the crowd is like midday. I can’t say that the East Village is one of my favorite neighborhoods in Manhattan. It’s a little to purposefully grungy for my tastes. But it is growing on my – slightly. The area around St Marks street has a lot of unique restaurants and shops to dive in and out of including Japanese style hotdogs (???) and an ice cream shop named Big Gay Ice Cream (love it!). 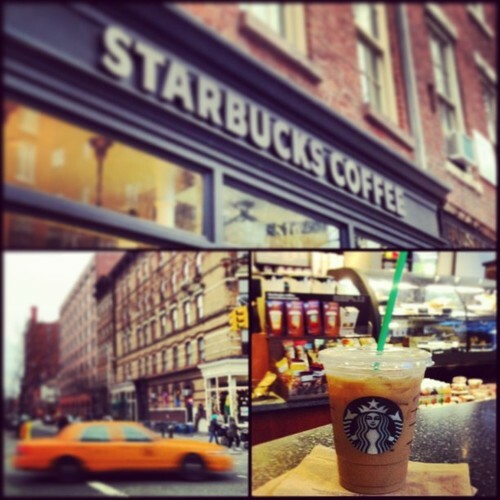 Today I’m sitting at the Starbucks on 3rd street and 1st avenue. As I sit here homeless and/or displaced New Yorkers hang out on the benches in front of the cafe while hipsters walk, bike and skateboard by. Earlier a saw one girl training another how to dance with a flaming hula hoop (I just can’t make this stuff up). The Starbucks itself is small for a corner location. The lounge is L-shaped and contains only a limited amount of seating. There’s a downstairs but that’s just for the Starbucks Partners. It does have a restroom — but unfortunately for the hundreds of people that came in just for that — it was out of order. I will say that the decor is pretty on-point and the Starbucks logo painted directly on the exterior bricks really tie this location to its neighborhood.